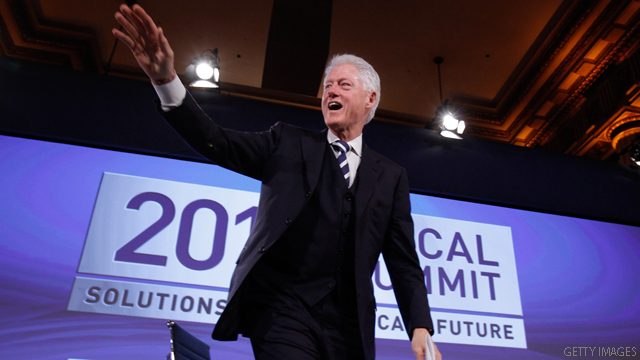 Washington (CNN) - Former president Bill Clinton enjoyed his most lucrative year ever on the speaking circuit in 2010, capping a decade of paid speaking events that has earned him $75.6 million since leaving office in 2001, according to a CNN analysis of federal financial records. Clinton received $10.7 million for 52 paid speaking engagements last year, a sizable increase from the 36 paid speeches he delivered in 2009 for a total of $7.5 million. The most the former president had previously earned in one year was in 2006 when he earned $10.2 million for 57 events. His 2010 speaking fees were detailed in Secretary of State Hillary Clinton's annual financial disclosure report released Monday. Almost half of the former president's speech earnings last year, $4.8 million, came from 18 speeches delivered in 13 other countries, ranging in distance from Canada and Mexico to India, the Philippines, and South Africa. The remainder was earned in 34 speeches delivered in eight states and the District of Columbia. In 10 years as a private citizen, Clinton has delivered a total of 417 paid speeches and earned an average of $181,000 per event. Almost two-thirds of his total speech earnings, about $44.9 million, have come from 215 overseas events in 48 countries. The former president's most popular destination outside of the United States has been Canada, where he has participated in 54 paid events for a total of $9.1 million, followed by the United Kingdom, where he earned $3.2 million for 16 events, and Australia and Mexico, where he delivered 13 speeches apiece for $2.3 million and $2.8 million, respectively. Within the U.S., Clinton has delivered 54 paid events in New York, 35 in California, 22 in Florida and 15 in Las Vegas, Nevada. Helping to propel the former president to his most lucrative year were two events for which he received a combined $1 million. The first was a June 2010 event in Moscow organized by Renaissance Capital. The other was a December speech delivered in the United Arab Emirates for Novo Nordisk, a global health care company. Clinton received $500,000 for each event, which tie for the second-largest payments he has received for a single event. In June 2008, he received $525,000 for a speech at a motivational speaking conference in Edmonton, Canada. The former president's annual earnings from speeches have varied from year to year depending on his schedule and availability. He gave only six paid speeches for $875,000 in 2004, when he spent much of the year writing his memoirs and recovering from heart bypass surgery. His $10.7 million haul from 2010 almost doubles the $5.7 million he earned in 2008, when he spent half the year campaigning for his wife's unsuccessful presidential bid. That year, Hillary Clinton loaned her presidential campaign a total of $13.2 million out of her and her husband's personal funds. The Clintons ended up eating the cost of that loan because the campaign was unable to repay the amount by the deadline required by federal campaign finance laws. However, since Hillary Clinton suspended her presidential campaign on June 7, 2008, her husband has earned $23.0 million in speaking fees for 108 events, more than canceling out the impact of the loan. Clinton was an elected official on a fixed government salary for all but two years from 1977, when he took office as the Arkansas attorney general, until leaving the White House in January 2001. "I never had any money until I got out of the White House, you know, but I've done reasonably well since then," said Clinton last year at a forum in Cape Town, South Africa. Though it is not unusual for former presidents to command millions of dollars in speaking fees after leaving office, Clinton is the only one subjected to strict disclosure requirements as a result of his wife's position as a high-ranking federal official, first as a United States Senator and now as Secretary of State. When President Obama first nominated then-Sen. Clinton, his former rival, to be the nation's top diplomat in December 2008, the former president agreed to a number of steps to guard against possible conflicts of interest that may arise from his various post-presidential activities. In particular, he has agreed to allow State Department and White House ethics officials to review his slate of proposed speaking engagements. The Center for Public Integrity, a public interest watchdog group, estimated in May that former president George W. Bush had delivered almost 140 paid speeches for at least $15 million in his two-and-a-half years since leaving the White House. A spokesman for President Bush's office declined to comment on the accuracy of that report. President Clinton's office did not respond to a request for comment on this article. He's already said that he doesn't mind raising his tax level to 39 %. Neither does Warren Buffet or Bill Gates. It's mostly the spoiled brats who INHERITED their $ that are complaining the loudest. Just think how much money President Obama will earn from speaking engagements, it will be a stagering amount. You go Bill Clinton, the World still loves you. I figure that all money that an x president earns as a result of his office should be the property of the people who elected him.. This money game they play to hide the facts that they were all involved in some scheme or another is getting old to me and i guess the FBI too???. Remember White Water Billy?? How many people died trying to protect u on that screw up,Bill??? So, why ask ordinary folks to help pay for your wife's outstanding campaign debts????? Harry Truman left office and went back to his farm and died like a man,he didn't have any money but he had honor.. That's one thing a president hasn't had in 30 yrs.in this country!! That is the kind of man we need as president now,one who's not all about the money but us the people of America. He had 105 million just after leaving office too. Where did he get that money and what was it for??? Now he's bragging about 75 million more? He has the guts of a convict and that's a fact.. That money he gets is ours and not his,whoever said they could profit from a job we gave him?? I'm sure I never voted on such a thing. Imagine if u opened free trade to China and ruined this countries economy it may be worth about 105 million. How about it Bill??? Everything he did in office and out is either criminal,because of kickbacks,deadly to others or immoral. What a guy?? Oh by the way he was the one who ruined our economy but opening free trade to China. Way to back your country Bill!!! I guess we didn't pay as well huh??? That's why the Dems don't want to raise the taxes on the rich, either..........they are just as rich as the GOP. Makes me thrilled that Obama got elected instead of the Big $ Corporatist Clinton machine...and their dousy of a sell-out Evan Bayh. Popular yes – looking after the middle class no. The Clintons are old school Dem's that cater to the Big $ Corporatists and their army of lobbyists. Clinton didn't have 5 cents when he went into office because of his legal fees and other things involved in White Water. Oh! That was his first scheme that was to bilk the elderly out of their retirement money on a real estate scam..I promise u this,i was here when he was doing it.. Now he's moved on to a bigger ripoff,getting his favor money in the way of high dollar speeches. How stupid does the American public have to be treated before the FBI gets into his scams?? Is he untouchable??? Maybe? maybe not.. I sure wish BIll could run again. Our economy prospered under his administration with more than 22 million jobs created while tax rates were at 39% and on schedule to pay down the national debt in 11 years. Under GWB with tax rates cut to 36% only 1 million jobs were created in 8 years. A Senior Drug plan put into law with no means to pay for it and 2 wars not included in the budget. You do the math. "Harry Truman left office and went back to his farm and died like a man,he didn't have any money but he had honor.. That's one thing a president hasn't had in 30 yrs.in this country!!" Right...because Clinton creating his foundation and helping millions around the world get health care and AIDS treatment and doing speaking engagements in order to promote its work, that's not honorable at all. What a jerk he is for caring. They are not speaking engagements,they are kick backs by just another name!! They are payments for favors and other illegal services made during his presidency.. Don't be fooled by the way they disguise their illegal activity payments. Clinton is at the least the best criminals on the planet.. With all the benefits we give him and after he took all we have,he and others have found a way to get more. Speaking engagements?? What a joke..
"Now he's bragging about 75 million more? " Yes, because when the "news" media decides it's going to dig something up and sensationalize it, that means the person about whom they are reporting is somehow bragging. First of all, that is capitalism in our society. Second, Bill made $200k a year in the White House. When you consider that the President is effectively the CEO of the most powerful country in the world, that amount is chickenfeed, compared to what other corporation CEO's are making, and made in his time in office. And the President had ten or twenty times the responsibilities and duties that any other CEO does. And then add in the massive legal bills he had to pay off, due to GOP's constant attacks on him. $60 million of our money to persecute him for what effectively boiled down to getting a **** job in the Oval Office. AND, our country was in a heck of a lot better shape then, under his administration, than it is now, after the GOP's ruinous eight years of destroying our economy. So, you go ahead Bill and make all the money you can. It is the American way and anyone who complains is just plain jealous! Dont forget to pay your taxes Bill. Plenty of people waiting on that money. Who pays for the travel expenses for these events?? The American public??? U bet we do!!! If he's going to collect his extortion payments at least he could pay for the travel and the cost of transporting the secret service agents all over the world. He should be made too.. I mean they said he's been doing it as a private citizen,so pay for it like a private citizen,Bill! The story of Bill Clinton's life,get the money for urself and make the Americans pay the expenses.. This guy really plays us for suckers. Maybe we are,he's doing it unchallenged.. This articles is a little off in the respect that he had 105 million just after he left office. I guess they forgot// That's when he made the real money from i'd figure the Chinese for opening the trade bridge. Explain how u have 105 million when u came into office broke??? U figure that and u may figure why the country is in an economic meltdown. If you don't like it, don't go to his speeches, and don't support organizations that hire him. I promise u this,i was here when he was doing it.. So why didn't superdave stop it? Oh yeah – Clinton didn't do anything wrong and I donbut if "you were there". Who tells better tales than a convicted perjurer? Now that's entertainment! I'm waiting for the left to now talk about how President Clinton doesn't NEED all that money (they always seem to know what everyone NEEDS). Let's hear how by earning all of this money, President Clinton is taking the money from someone else. I don't believe that for a second. I don't get it, but if someone wants to pay good money to hear someone else speak, so be it. I'll just find it kind of ironic if no one on this site screams about how he has too much. Fat chance. That only applies to conservatives. I'm a pretty conservative person, but for sheer entertainment value, I sure do miss that guy.